TIP: IST offers training for G Suite! For more information, go to the Training page. You can have your emails automatically forwarded to another email address. This is helpful for situations when you are unable to access G Suite in another country. You can forward all of your new messages, or just specific kinds of messages. Note that spam messages aren’t included when you choose to forward all new mail. 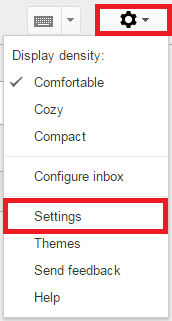 NOTE: To forward emails from another email provider your UCA Gmail account, you’ll need to change your settings in the other account, not in Gmail. Visit your other email provider’s help center to find out if automatic forwarding is available and how to set it up. Click the tab Forwarding and POP/IMAP. Google will send a verification email to that address. Open your other email account and find the confirmation message from the Gmail team. If you’re having trouble finding it, check that account’s Spam folder. Back in your Gmail account, refresh (or reload) the page in your web browser, or press the F5 key. To finish, click Save Changes at the bottom of the page.